Sergei Nikolaevich Bulgakov (; Russian: Серге́й Никола́евич Булга́ков; 28 July [O.S. 16 July] 1871 – 13 July 1944) was a Russian Orthodox Christian theologian, philosopher, and economist. Sergei Nicolaevich Bulgakov was born on 16 July 1871 to the family of an Orthodox priest (Nikolai Bulgakov) in the town of Livny, Oryol guberniya, in Russia. He studied at Orel seminary, then at Yelets gimnasium. In 1894 he graduated from the Law School of Moscow University, where he had also undertaken a serious study of political economy. During his study at the seminary Bulgakov became interested in Marxism and took part in the Legal Marxism movement. Under the influence of works of Russian religious thinkers (Leo Tolstoy, Fyodor Dostoyevsky, Vladimir Solovyov, etc. ), in the course of his meetings and arguments with Leo Tolstoy he found his religious beliefs again. He wrote a book about his evolution (Sergey Bulgakov, From Marxism to Idealism, 1903). Such an evolution was common for the Russian intelligentsia of the time, and he soon became one of their recognised ideologists. A primary contributor to the books Problems of Idealism (1902), Vekhi, Problems of Religion, About Vladimir Solovyev, About the Religion of Leo Tolstoy, The Religion of Solovyov's Philosophical Society, he participated in the journals New Way (Новый Путь) and Questions of Life (Вопросы Жизни). He was a leader of the publisher Way (Путь, 1911–1917), where he printed many important works of contemporary Orthodox theology. In 1907 he was elected as an independent Christian Socialist to the Second Duma. He published the important original monographs Philosophy of Economy («Философия хозяйства» 1912) and Unfading Light («Свет Невечерний» 1917), in which he first offered his own teaching based on the combination of sophiology of Vladimir Solovyov and Pavel Florensky, the later works of Schelling, and his own intuition-based ideas about the Orthodox Christian faith. In 1918, having returned to the Orthodox Church, he was ordained to the priesthood, and rose to prominence in church circles. He took part in the All-Russia Sobor of the Russian Orthodox Church that elected patriarch Tikhon of Moscow. 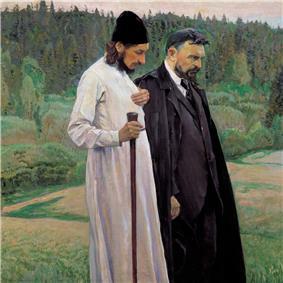 Bulgakov rejected the October revolution and responded with On the Feast of the Gods ("На пиру богов", 1918), a book similar to the Three Talks of Vladimir Solovyov. During the Russian Civil War he was in Crimea, where he worked in the field of philosophy. He wrote books Philosophy of the Name ( "Философия имени", 1920) and Tragedy of Philosophy ("Трагедия философии", 1920) in which he revised his views about the relation of Philosophy to Dogmatism. He concluded that the Christian views can be expressed only by dogmatic theology. Thereafter his works were devoted to dogmatic theology. On 30 December 1922 the Bolshevik government expelled some 160 prominent intellectuals on the so-called Philosophers' ship, Bulgakov, Nikolai Berdyaev, and Ivan Ilyin among them. In May 1923 he became professor of Church Law and Theology at the school of law of the Russian Research Institute in Prague. In 1925 he helped found St. Sergius Orthodox Theological Institute (l'Institut de Théologie Orthodoxe Saint-Serge), in Paris, France. He was the head of this institute and Professor of Dogmatic Theology until his death from throat cancer on 12 July 1944. His last work was devoted to the Apocalypse. Bulgakov’s teaching on sophiology is highly controversial. The attempt to understand it properly is hindered by the highly political controversy surrounding it in the 1930s. By 1931 there existed three separate Russian Orthodox jurisdictions in Europe: Patriarch of Constantinople—though in 1934, Met. Evlogy was privately reconciled to Met. Anthony, and in 1935 he went to Karlovtsy for a special reunion conference, at which time the schism between him and ROCOR was healed In 1936, Met. Evlogy again cut his ties with ROCOR, quite possibly because of the controversy over Sophianism. In the Decree on Sophianism, an ukaz of 24 August 1935 of Met. Sergius, Bulgakov’s teaching on ‘Sophia’ was described as ‘alien’ to the Orthodox faith. This ukaz was largely based on the epistolary reports of Alexis Stavrovsky. He was also the president of the Brotherhood of St Photius (Alexis Stavrovskii was president; Vladimir Lossky, the vice-president, and Evgraf Kovalevskii, later Jean-Nectaire Kovalevsky of Saint-Denis, were also among the 12-15 young laymen who made up its numbers) whose members had left the jurisdiction of Metropolitan Evlogy for that of Met. Elevthery of Lithuania. This exodus was in reaction to Met. Sergius having removed, on 10 June 1930, Met. Evlogy as the head of the Russian Orthodox Church in Western Europe (since Metropolitan Evlogy had continually refused to agree to the 30 June 1927 Declaration of Loyalty to the Soviet government) and named Elevthery as his replacement. In late 1935, Metropolitan Evlogy appointed a commission to look into the charges of heresy levelled against Bulgakov. The commission quickly broke into factions. In June 1936 the majority report (prepared by Vasilii Zenkovskii, Georges Florovsky, who despite his personal respect for Fr. Sergius, remained an ardent critic of Sophianism for the remainder of his life. Meanwhile, the Church Abroad formally accused Bulgakov of heresy in 1935. In the words [of Fr. Sergius Bulgakov], when the Holy Spirit came to dwell in the Virgin Mary, she acquired "a dyadic life, human and divine; that is, She was completely deified, because in Her hypostatic being was manifest the living, creative revelation of the Holy Spirit" (Archpriest Sergei Bulgakov, The Unburnt Bush, 1927, p. 154). "She is a perfect manifestation of the Third Hypostasis" (Ibid., p. 175), "a creature, but also no longer a creature" (P. 19 1)....But we can say with the words of St. Epiphanius of Cyprus: "There is an equal harm in both these heresies, both when men demean the Virgin and when, on the contrary, they glorify Her beyond what is proper" (Panarion, Against the Collyridians). This Holy Father accuses those who give Her an almost divine worship: "Let Mary be in honor, but let worship be given to the Lord" (same source). "Although Mary is a chosen vessel, still she was a woman by nature, not to be distinguished at all from others. Although the history of Mary and Tradition relate that it was said to Her father Joachim in the desert, 'Thy wife hath conceived,' still this was done not without marital union and not without the seed of man" (same source). "One should not revere the saints above what is proper, but should revere their Master. Mary is not God, and did not receive a body from heaven, but from the joining of man and woman; and according to the promise, like Isaac, She was prepared to take part in the Divine Economy. But, on the other hand, let none dare foolishly to offend the Holy Virgin" (St. Epiphanius, "Against the Antidikomarionites"). The Orthodox Church, highly exalting the Mother of God in its hymns of praise, does not dare to ascribe to Her that which has not been communicated about Her by Sacred Scripture or Tradition. "Truth is foreign to all overstatements as well as to all understatements. It gives to everything a fitting measure and fitting place" (Bishop Ignatius Brianchaninov)." Bulgakov responded to the heresy accusation in his Dokladnaia zapiska Mitropolitu Evlogiiu prof. prot. Sergiia Bulgakova (Paris, 1936). 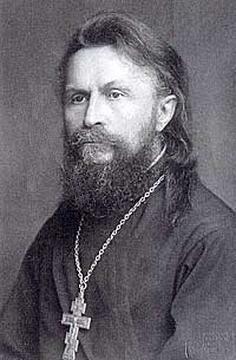 Archbishop Seraphim then rebutted Bulgakov in his Zashchita sofianskoi eresi (Sofia, 1937). No final report was prepared on the sophiology controversy by the commission set up by Bulgakov’s own jurisdiction. However, Metropolitan Evlogy convoked a bishop’s conference on 26–29 November 1937 to bring closure to the matter. The bishops in their statement were working from reports by Archimandrite Cassian (Bezobrazov) and Chetverikov and they concluded that the accusations of heresy against Bulgakov were unfounded but that his theological opinions showed serious flaws and needed correction. Bulgakov in some respects sympathized with the doctrine of universal reconciliation, with the reservation that the continuing punishment of the immortal souls of the wicked in hell may be unending since human free choice can never be destroyed. There is conflict in the studies regarding how conservative Bulgakov was. A classmate of Bulgakov's said he had been called a "jingoistic monarchist" and that he did not attend discussion groups. 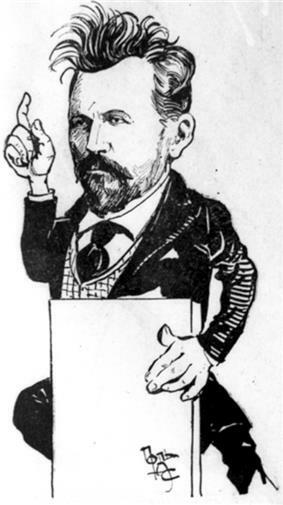 Together with Petr Struve, Bulgakov founded the illegal liberal Union of Liberation (which later emеrged as the Constitutional Democratic (Kadet) Party, the largest party in Russia between 1906–1907), and was one of the key persons in the journal Liberation (1902–1905). Because of the circle's secularism, which conflicted with Bulgakov's religious views, he left the society to join the liberal nationalist and socio-Christian Union of Christian Politics. When that circle was dissolved Bulgakov was more active in the Orthodoxy, so his leanings became liberal conservative. Bulgakov, Sergius (2004). The Comforter. Grand Rapids, MI: Wm. B. Eerdmans Publish. Co. p. 398. Bulgakov, Sergius (2002). Bride of the Lamb. Grand Rapids, MI: Wm. B. Eerdmans Publish. Co. p. 531. Bulgakov, Sergius (2009). The Burning Bush: On the Orthodox Veneration of the Mother of God. Grand Rapids, MI: Wm. B. Eerdmans Publish. Co. p. 191. Bulgakov, Sergius (2003). The Friend of the Bridegroom: On the Orthodox Veneration of the Forerunner. Grand Rapids, MI: Wm. B. Eerdmans Publish. Co. p. 190. Bulgakov, Sergius (1988). The Orthodox Church. Crestwood, NY: St. Vladimir's Seminary Press. p. 195. Bulgakov, Sergius (1993). Sophia, the Wisdom of God: An Outline of Sophiology. Hudson, NY: Lindisfarne Press. p. 155. Bulgakov, Sergius (1997). The Holy Grail and the Eucharist. Hudson, NY: Lindisfarne Books. p. 156. Bulgakov, Sergius (2008). Churchly Joy: Orthodox Devotions for the Church Year. Grand Rapids, MI: Wm. B. Eerdmans Publish. Co. p. 147. Bulgakov, Sergius (2010). Jacob's ladder: on angels. Grand Rapids, MI: Wm. B. Eerdmans Publish. Co.
Bulgakov, Sergius (2011). Relics and Miracles. Two Theological Essays. Grand Rapids, MI: Wm. B. Eerdmans Publish. Co.
Bulgakov, Sergius (2012). Icons and The Name of God. Grand Rapids, MI: Wm. B. Eerdmans Publish. Co.
Bulgakov, Sergius (2012). Unfading Light. Grand Rapids, MI: Wm. B. Eerdmans Publish. Co.
^ "Bulgakov". Collins English Dictionary. ^ "Sergei Bulgakov » News from different disciplines". yqyq.net. 2009. Retrieved 9 December 2011. ^ For commentary, texts and a fuller account of the sophiological controversy see Antoine Arjakovsky, Essai sur le père Serge Boulgakov (1871-1944), philosophe et théologien chrétien (Paris: Les Éditions Parole et Silence, 2006), pp. 99-125 and La génération des penseurs religieux de l’émigration Russe: La Revue ‘La Voie’ (Put’), 1925-1940 (Kiev/Paris: L’Esprit et la Lettre, 2002), pp. 433 ff., N. T. Eneeva, Spor o sofiologii v russkom zarubezh’e 1920-1930 godov (Moscow: Institut vseobshchei istorii RAN, 2001), Igumen Gennadii (Eikalovich), Delo prot. Sergiia Bulgakova: Istoricheskaia kanva spora o Sofii (San Francisco: Globus Pub., 1980), Bryn Geffert, ‘Sergii Bulgakov, The Fellowship of St Alban and St Sergius, Intercommunion and Sofiology’, Revolutionary Russia, 17:1 (June 2004), pp.105-41, ‘The Charges of Heresy Against Sergii Bulgakov: The Majority and Minority Reports of Evlogii’s Commission and the Final Report of the Bishops’ Conference’, St Vladimir’s Theological Quarterly, 49.1-2 (2005), pp.47-66 and especially Alexis Klimoff, ‘Georges Florovsky and the Sophiological Controversy’, St Vladimir’s Theological Quarterly, 49.1-2 (2005), pp.67-100. ^ Timothy Ware, The Orthodox Church (London: Penguin Books, 1964); p. 184. ^ Bulgakov responded to the ukaz in his O Sofii Premudrosti Bozhiei: Ukaz Moskovskoi Patriarkhii i dokladnye zapiski prot. Sergiia Bulgakova Mitropolitu Evlogiiu (Paris: YMCA, 1935), pp. 20-51. Vladimir Lossky then published a well-known critical analysis of Bulgakov’s response to the ukaz as Spor o Sofii (Paris, 1936). ^ St. John Maximovitch, "The Orthodox Veneration of the Mother of God". , (Platina, Ca: St. Herman Press, 1978), p. 40 ff. ^ Sergeĭ Nikolaevich Bulgakov The Orthodox Church intro page xiii 1988 "God does not punish; he forgives. Sinful creatures may refuse His forgiveness. This refusal (which may be unending since human free choice can never be destroyed) makes hell to be hell. In a word, God has mercy on all, whether all like." ^ Sakwa, Richard (2002). Russian politics and society. Routledge. ^ Valliere, Paul (2000). Bukharev, Soloviev, Bulgakov. Continuum International Publishing Group. R. Williams, Sergii Bulgakov: Towards a Russian Political Theology (1999) Continuum.